Hey, guys. We just went to a Scholastic Warehouse Super Sale in Pasig. When I found out that there's a Book Sale happening right now, I was so like Oh-My-Gosh! It's a very good timing 'coz I really want a new book for my little bookworm baby bears Sam and Mady. So after I read the post from Lady's Motherhood Journey (one of Mommy Bloggers Ph) I must go here on Sunday. So I tagged along with my hubby and my son, Sam. Regarding the post, you can buy a book for as low as 20 pesos. And yes, we found that. My main target is to look for children's book. But when we enter the store, I first found this. Though I'm aware that they also have Harry Potter, Divergent Series, Hunger Games Series, etc. in a very huge discount. A Fantasy book for Mommy. 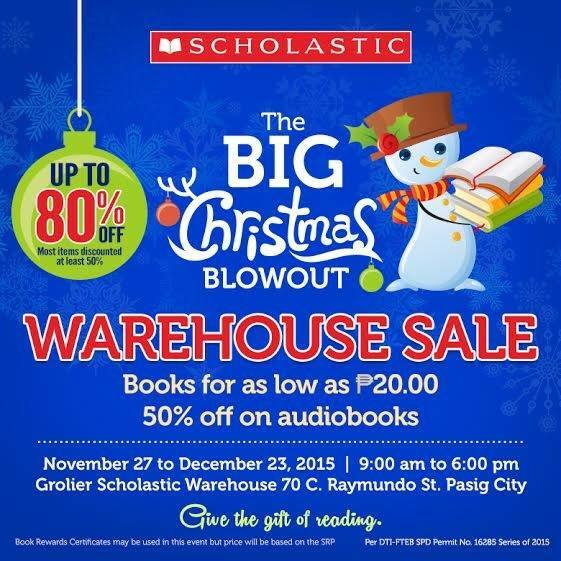 To know more about the Scholastic Warehouse Sale, you may visit Lady's Motherhood Journey.